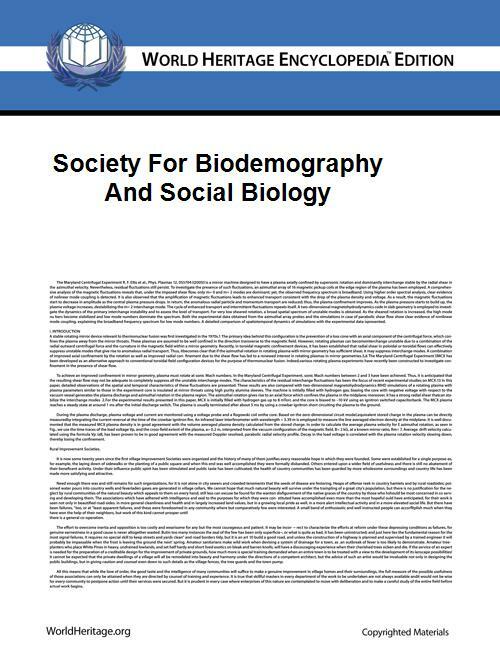 The Society for Biodemography and Social Biology, formerly known as the Society for the Study of Social Biology and the American Eugenics Society, is dedicated to "furthering the discussion, advancement, and dissemination of knowledge about biological and sociocultural forces which affect the structure and composition of human populations." Biodemography and Social Biology The academic journal. ^ Messall, Rebecca (Fall 2004). "The Long Road of Eugenics: From Rockefeller to Roe v. Wade". The Human Life Review 30 (4): 33–74, 67. ^ American Eugenics Society, Inc. (1931). Organized eugenics: January 1931. pp. 3, 65.